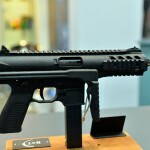 Starting in 1992 Steyr began work on the Tactical Machine Pistol (TMP), a select-fire pistol that was smaller and lighter (2.6 lbs) than near anything in its class previously on the market. A semi-automatic variant was produced in 1993 as the Special Purpose Pistol (SPP) and imported to the United States for a short time. The SPP lacked the integral front grip of the TMP. 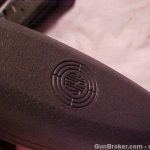 A seller on GunBroker has a rare offering currently listed. The Steyr SDF, a prototype sub-carbine. This is the only one of its kind I have seen or heard of. This carbine comes with no box or papers and only one 10 round magazine. Unlike early imports of the SPP, the SDF and later SPP models had the optic rail shown here. The barrel markings show it as an SPP with the SDF marking after the serial number and proof marks. “SDF” is also shown on the underside of the frame below the importer’s marking. Unfamiliar with the SPP SDF, I checked two SPP pistols and confirmed they lacked the “SDF” engraving. It is only a guess but this could be serial number five of the run as “24005”. 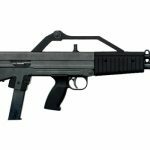 Only a few of these were brought in for testing but any plans were laid to waste by the introduction of the Public Safety and Recreational Firearms Use Protection Act (AKA 1994 Assault Weapon Ban). 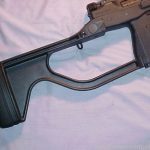 The SDF carbine has a factory 17″ Steyr made barrel with detachable stock. 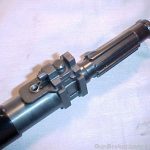 Per the seller it is not believed a standard SPP pistol barrel can be installed on the SDF, likely to avoid issues with the ATF and importation. This was purchased from the importer GSI, Inc. after a SHOT Show. 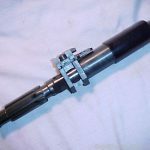 My opinion is the TMP and SPP’s biggest failure was a lack of a compact collapsing or folding stock. 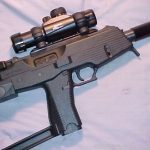 Steyr later offered a removable fixed stock like the one used on the SDF, as well as toying with a collapsing prototype. If anyone knows more about this or other related prototypes, I’d love to hear from you. All photos used with permission from the seller. The auction for this firearm can be found here. 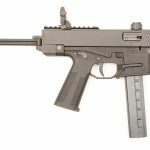 B&T AG (then Brügger & Thomet) took over the Steyr license in 2001 with major production starting in 2004 as the MP9 (select fire) and the TP9 (semi-auto). 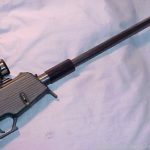 The biggest differences are the addition of an attachment point for a folding stock, improved trigger, and integral Picatinny optic rail. 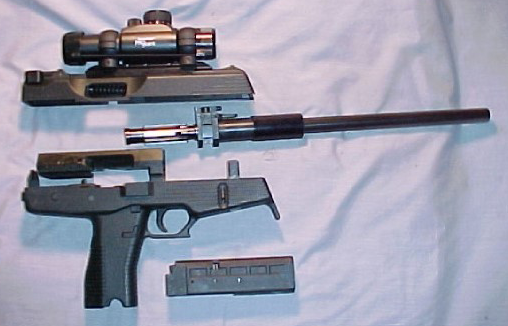 In late 2006 DSArms began importing the B&T TP9 pistol. It was more recently reintroduced to the civilian market by B&T USA in 2015. In all this time no carbine variant like the SDF has been available.